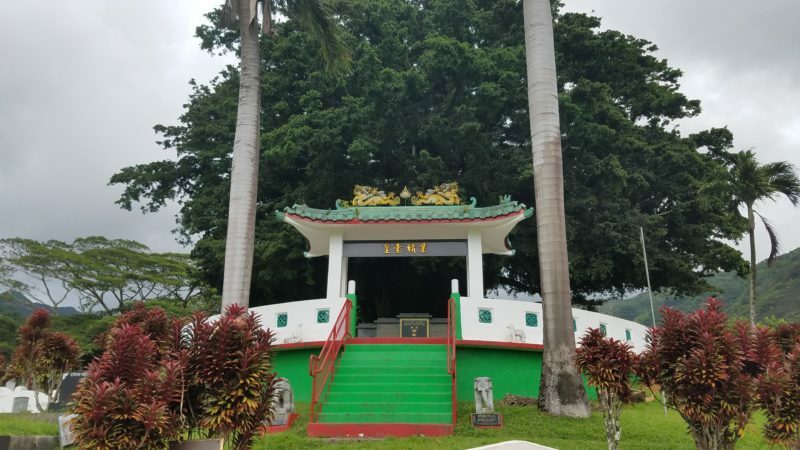 The Manoa Chinese Cemetery is steeped in history, tradition, and a spiritual connection to revered ancestors. For most Hawaii visitors, strolling through a graveyard is probably not the first thing to come to mind when planning a Hawaii vacation. But the Manoa Chinese Cemetery isn’t gloomy. It’s solemn, but not grim. There are many things to explore in Manoa. Taking a half-hour to take in the quiet calm of the grounds after, say, a hike to Manoa Falls, is easy. And all are welcome. Manoa itself is full of treasures. It’s waterfalls and hiking trails are perhaps the most popular on Oahu. It is a neighborhood of architectural gems, historic homes in a variety of designs that are now nostalgic. Several of Manoa’s eateries have become local favorites. The Manoa Chinese Cemetery is the most recognizable feature of the lush valley’s many charms. It was established in 1851, not long after Oahu Cemetery was dedicated in neighboring Nuuanu Valley in 1844. 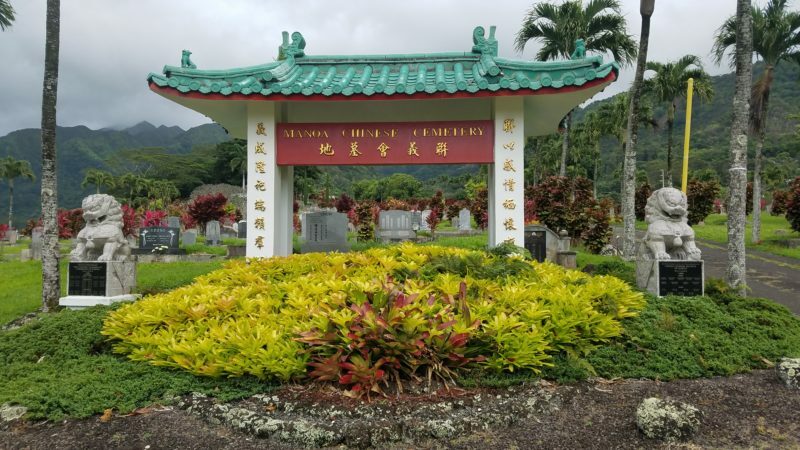 It is the oldest and certainly most historically significant Chinese cemetery in Hawaii. 31 founding families pooled six months of income to purchase the land. The property climbs a ridge that peaks at the edge of Manoa’s famous forest. It has an ideal traditional layout for a Chinese cemetery, facing the sea and surrounded by lush mountains teeming with life. One of the founders of the Manoa Chinese Cemetery was a man named Lum Ching, known now as the “Grand Ancestor”. He designed the cemetery using what are known as “geomantic” principles. Most know this concept as “feng shui”. The massive banyan tree at the top of the cemetery was planted in his honor. Its canopy towers over the property, a living memory of a man dedicated to revering family and ancient Chinese traditions. 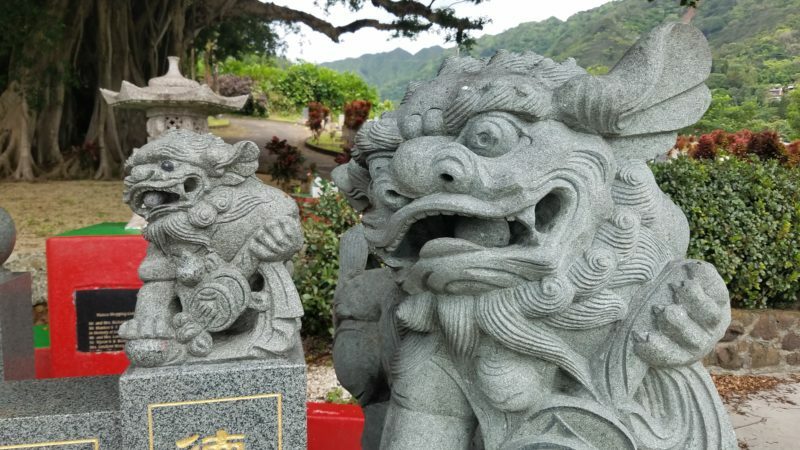 Granite lions guard the spirits of ancestors in the Manoa Chinese Cemetery. There are other notable burials at the cemetery. It is home to the tomb of “the Mayor of Chinatown”, Henry Awa Wong. He was the owner of the famous Wo Fat Chinese Restaurant and Hawaiian Oke & Liquors, among many other firsts for immigrants in Hawaii. The cemetery is also home to a children’s section, where infants were buried during a time when infectious disease claimed many lives in Hawaii and around the world. Chang Apana, a famous detective with the Honolulu Police Department and the inspiration for the Charlie Chan detective series is buried in the Manoa Chinese Cemetery. The property was the location of the summer home of King Kamehameha the Great and his Queen Kaahumanu. It is the final resting place of generations of luminaries in Hawaii’s Chinese community. The Manoa Chinese Cemetery is most active during the annual Ching Ming memorial festival each spring. It has seen the US Marine Corps Band and the Royal Hawaiian Band perform, 21-gun salutes, and helicopter flower-drops over the years. It’s not unusual for governors, mayors, and other political leaders to attend Ching Ming events. Hundreds turn up for the festivities. A large family shrine at Manoa Chinese Cemetery. And while the Manoa Chinese Cemetery remains a vital Chinese community resource, it is open to all faiths. The cemetery has moved into the modern age but remains rooted in Chinese traditions that reach back to ancient times. A statue of China’s first emperor, Qin Shihuangdi, guards the cemetery’s entrance. Ruling in the 3rd century BC, he began the Great Wall of China, standardized written language and weights and measurements, and created his world-famous tomb of 8000 terra cotta warriors. Granite and marble lions comprise part of a menagerie of sculptures throughout the hillside, including a large shrine featuring carved images of the creatures of the Chinese zodiac. At the Manoa Chinese Cemetery, even the ancient past is present.